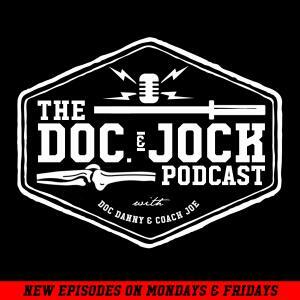 On Episode Sal Di Stefano 210 of the Doc and Jock Podcast we are joined by Sal Di Stefano of the Mind Pump Podcast jump the show to talk about Mom’s, developing a fitness business mindset, podcasting, technology, fitness and training kids. If that sounds like a mouth full it is! For more on Sal check out his bio and cruise on over to Mind Pump Media! Sal was 14 years old when he touched his first weight and from that moment he was hooked. Growing up asthmatic, frequently sick and painfully skinny, Sal saw weightlifting as a way to change his body and his self-image. In the beginning, Sal’s body responded quickly to his training but then his gains slowed and then stopped altogether. Not one to give up easily, he began reading every muscle building publication he could get his hands on to find ways to bust through his plateau. He read Arnold’s Encyclopedia of Bodybuilding, Mentzer’s Heavy Duty, Kubrick’s Dinosaur Training, and every muscle magazine he could find; Weider’s Muscle and Fitness, Flex, Iron Man and even Muscle Media 2000. Each time he read about a new technique or methodology he would test it out in the gym. At age 18 his passion for the art and science of resistance training was so consuming that he decided to make it his profession and become a personal trainer. By 19 he was managing health clubs and by 22 he owned his own gym. After 17 years as a personal trainer he has dedicated himself to bringing science and TRUTH to the fitness industry.